MSI presents the Radeon HD 7870 HAWK edition, this model features a custom cooler and features a 1100MHz core and 2GB GDDR5 clocked at 4800MHz. Leading international graphics card and mainboard maker MSI today announced MSI R7870 Hawk, equipped with AMD's 28nm Radeon HD 7870 GPU. MSI introduce the flagship design concept of Lightning series into R7870 Hawk, adopting UnlockedDigitalPower that incorporates an Unlocked BIOS, DigitalPWM Controller, and Enhanced Power Design to boost overclocking potential and make overclocking easier than ever. With the industry first "GPU Reactor" power panel, it reduces power supply noise as well as increases overclocking stability. As for thermal solution, MSI R7870 Hawk utilizes the latest Twin Frozr IV Thermal Design with Dust Removal Technology. The dual 8cm fan setup with PropellerBlade Technology generate massive airflow for fast heat dissipation while remaining whisper silent. The two form-in-one heatsinks improve cooling for memory and the power module as well ensure structural integrity. The R7870 Hawk uses Military Class III components which have passed rigorous testing to meet MILSTD810G standards, guaranteeing the card's stability and reliability under actual use conditions. Moreover, the "3X3 OC Kits" are designed to simplify overclocking, which makes it easier for users to fine-tune their graphics cards. Competing with flagship design of Lightning series, R7870 Hawk absolutely stands out on top among the industry's HD 7870 based graphics cards. The MSI R7870 Hawk implements the innovative "GPU Reactor" power panel which, when installed on the back of the GPU, increases current volume by 5 times, reduces power supply noise by 20%, and improves the overall GPU overclocking stability. MSI GPU Reactor is easy to install and has built in safety features that make it easy even for ordinary users to install and remove. MSI exclusive Unlocked DigitalPower is composed of the Unlocked BIOS, DigitalPWM Controller, and Enhanced Power Design. Unlocked BIOS gives you an increased PowerTune limit (up 57%) as well as more relaxed AMD Catalyst Control Center and OverCurrent Protection limits which means access to the MSI R7870 Hawk full overclocking potential. The DigitalPWM Controller provides more stable and accurate voltage signals than analog designs, meaning the voltage can be adjusted more quickly and precisely during overclocking. Enhanced Power Design provides more power than the reference design. 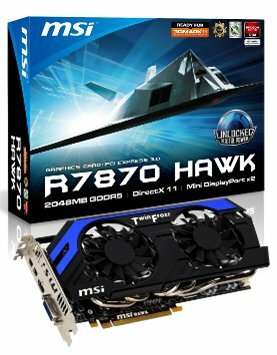 Equipped with Unlocked DigitalPower, the MSI R7870 Hawk is the best tool for gamers. The MSI R7870 Hawk incorporates the next-generation Twin Frozr IV Thermal Design. The striking design of the new Twin Frozr IV comes from the two 8cm PWM fan setup with PropellerBlade Technology and two 8mm SuperPipes to enhance heat dissipation. MSI has also incorporated its exclusive Dust Removal Technology in the Twin Frozr IV enhancing the Thermal performance over a long lifespan because at every boot, the fan will reverse for 30 seconds when booting to remove dust from heat sinks. The two form-in-one heat sinks cool the memory and power modules, ensure the structural integrity and card is protected from any accidental dents or scratches. The Twin Frozr IV on MSI’s R7870 Hawk is 15°C cooler and 5.7dB quieter than the reference design. MSI has always led the industry thanks to its unyielding commitment to product stability and quality and equipped the R7870 Hawk with its with Military Class III components. The tantalum-core Hi-c CAP around GPU, powerful CopperMOS cooled MosFETs and SSC (Solid State Chokes) completed by the rust-proof Dark Solid CAP all work together to deliver the best possible stability. The 3X3 OC Kits are designed for overclockers: V-Check Points allow monitoring of GPU, Memory and VDDCI voltage with a multi-meter while Triple Overvoltage and Triple Temp Monitor allow overclockers to quickly fine-tune and track the condition of graphics cards in MSI Afterburner. MSI brought several innovative design concepts of the R7970 Lightning to the R7870 Hawk such as UnlockedDigitalPower, GPU Reactor, Twin Frozr IV Thermal Design and 3X3 OC Kits. This provides users with a perfect user experience and the best product performance.